Front Row (Left to Right): June Ventresca, June Ritchie (Board Secretary), John Nichols (Board Chair), Garry C. Hopkins (CEO), Jim Edwards (Vice Board Chair), and Gwen Barron. The IOOF Seniors Homes is governed by a dedicated group of thirteen volunteer Directors who possess a strong fiduciary duty to the Corporation. 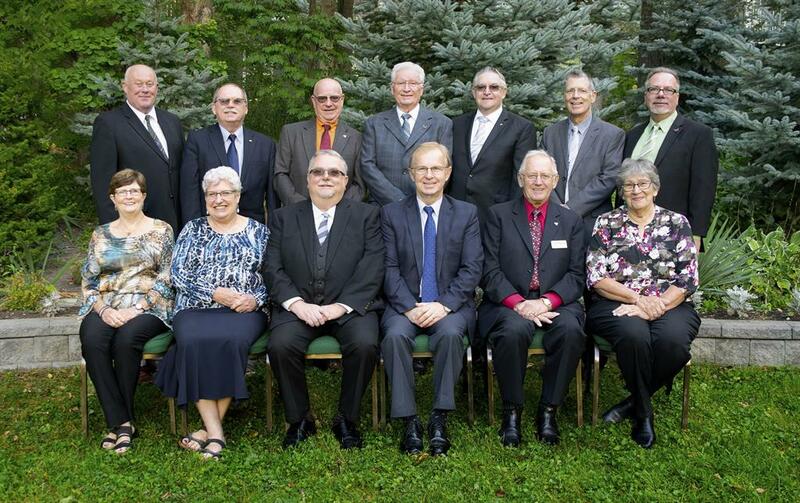 Many travel a good distance from various locations in Ontario to attend Board meetings. Historically the Independent Order of Odd Fellows (I.O.O.F), known for caring for the "disadvantaged, seniors, and orphans" in Ontario for well over a century, managed the original 40 bed Home in Barrie which they bought in 1940. The letters I.O.O.F. stand for the “Independent Order of Odd Fellows”. “Rebekahs” is the name given to the women’s branch of the fraternity. When the long-term care Home was rebuilt in 1980, government funding required the restructuring of the organization as a new corporate entity which now operates independently of the ‘Order.’ In honour of the historical contribution of the Independent Order of Odd Fellows, the Home and Manor still bear the Odd Fellow name and the present corporation is still known as the IOOF Seniors Homes Inc. As well, the Corporation’s By Laws provide that three of the Board must still be members of the Odd Fellows and three from the Rebekahs. In 2006 the corporate name was shortened from the I.O.O.F. Senior Citizens Homes Inc. to IOOF Seniors Homes Inc., a charitable non-profit corporation. Seven of the thirteen member Board are community positions that may be recruited throughout the year for appointment /election in June at the annual AGM. We are always interested in finding new members who live within the community. As a member of this volunteer Board, you would be strongly committed to the Mission, Vision and Values with have strong personal and professional integrity. As a volunteer Director, you would have experience with, or be comfortable with, the governance – as opposed to management – role. You would be responsible for governing and directing the affairs of the Corporation in accordance with applicable legislation, accountability agreements, approved strategic plans, and government policies. The deadline for applications is the end of March each year.